The books feature Robert Irwin of Australia Zoo fame and his adventures as a keen dinosaur hunter. The first one, The Discovery, features Robert enjoying his ninth birthday present, a trip to the Dinosaur Museum at Winton. He has a friend called Riley (who is the object of some rather patronising characterisation) and he makes an improbable discovery of a fossil which leads to some not very convincing time travel. No 2, Ambush at Cisco Swamp finds Robert and Riley at Cisco Swamp in Texas for an alligator survey where his dinosaur fossil takes him back in time again, and yes, Armoured Defence, set in the Canadian Badlands (No 3) and The Dinosaur Feather (back in Australia at the Australia Zoo (No 4) are more or less exactly the same formula. I suspect that most kids are not going to mind the rather weak narrative at all, but will appreciate the familiarity in much the same way as they appreciate the weak narratives and predictable characterisation of Enid Blyton books. At least these are Australian! For older students investigating marketing, decoding the copyright page might be an interesting exercise. The publicity material and the website tell us that the books are ‘co-created’ by nine year-old Robert Irwin and his name is the one that’s on the copyright page. His cute picture is on the front cover too – but the title page suggests that the series is actually written by author Jack Wells. Robert Irwin is also ‘proud that his illustrations appear in the books’, and so they do, identified as ‘drawn by Robert Irwin’ at the back of the book where the facts about the dinosaurs are, but the copyright page names the illustrator as Lauchlan Creagh who presumably did the full-page B&W drawings that feature within the text. (The books aren’t as profusely illustrated as you might expect in books for this age group). There is also a message enticing the reader to scan the QR code on the back of the book, which could lead to an interesting discussion about the use of these codes as part of an advertising strategy. It’s tempting to dismiss the series as a clever marketing exercise, latching onto the popularity of young Robert Irwin and the tourism that goes with him, but the books will appeal to young readers, especially boys at that difficult age when they start to abandon reading. They will like the adventure, the humour, the field guide at the back of the book and the easy reading, and unless they have been under a rock and have missed the hype about the junior Irwins, they will enjoy identifying with the famous young hero as well. I think they will be very successful in school reading schemes of one sort or another, and that parents will happily respond to pleas to buy the next one in the series. Last week I mistakenly entered a ‘New Zealand only’ give-away to win a book for my school’s library but was delighted to receive a friendly email back from Ford Street Books – who today sent me three lovely new titles destined to make my students very happy indeed. First up is a new title in the ever popular TooCool series written by Phil Kettle. These books walk off the shelves at school because they’re funny (though some teachers reading aloud may wish to skip the baked beans humour). They appeal to boys because they’re about action not emotion, and also because boys identify with TooCool’s adventurous spirit and the outdoor activities he gets involved in, from surfing to cricket to BMX bikes. The books have easy-to-read text and the distinctive B&W illustrations by Tom Jellett enhance the humour while also providing some reading support for readers in the 8-9 year old age range. The topics are distinctively Australian, which I think is really important: they reflect our multicultural society and our culture, and the laconic Aussie humour really appeals. When I told Mum that I was going to spend the entire summer holidays practising my drum playing, she smiled. It was the same smile she had smiled when my next-door neighbour Wong gave me the drum kit. TooCool and his mate Spike head off to Uncle Buck’s farm where they learn the rudiments of jackarooing, and there’s some handy tips at the back of the book for kids who want to look the part themselves. There’s a glossary and some kid-pleasing jokes too. Marcy, Award Winners is Book 15 of Series 2, due to be released in early March. The narrative voice is not quite as successful as the authentic-sounding TooCool. The plot revolves around a newspaper reporter interviewing Marcy and her friend Bella about winning the Animal Carer of the Year Award, and it’s a little bit long-winded and there is less action. But the jokes are good, and once again it’s easy-reading for 8-9 year olds. The book that really enchanted me was The Lost Tail by Patricia Bernard and Tricia Oktober. It’s the first picture book I’ve ever come across that is set in New Guinea, and it’s a beautiful introduction to the rich and complex culture that’s on our geographical doorstep. The story features little Nura, who lives in a traditional society where the Bundi Boys dance group are all set to perform their snake dance at the Goroka Show. It’s his job to carry the snake’s tail, but he has a long and sometimes scary journey to get there first, and it’s very easy to get lost in the crowd when he gets there. When he sleeps in on the big day, he finds himself alone for the first time in his life, and he mustn’t let his group down…. The pictures by Tricia Oktober are gorgeous, depicting the stunning facial and body decorations of the different tribes that attend the Goroka Show and bringing alive little Nura’s emotional journey. This is a must-have for any primary school library. Or direct from Ford St Publishing, see also their Upcoming Titles page, and the Teachers’ Notes. I was recently reminded just how lucky I am to have access to a good library. There was one of those old ladies who loves to chat in the queue at the post office the other day, and before she tottered off on her walking frame, she told our genial postmaster Eddie all about the parcels she was posting (at significant expense). They were books that she’d borrowed because there had been a fire in the library at her retirement home, and she did not know that our local library has a special service for housebound readers, with volunteers delivering and exchanging the books to their homes. Because this old lady was so slow on her pins, I was able to catch up with her after I’d posted my parcel and share what I knew about this valuable service. She was delighted, and by now I expect that the library has a new borrower. But great as this service is, there is no substitute for actually being able to visit and browse around a library. 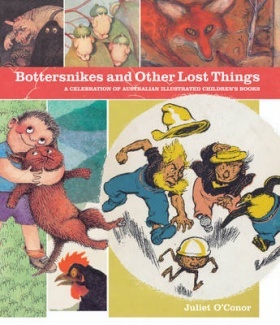 I often make serendipitous discoveries on my visits, and Bottersnikes and Other Lost Things: A Treasury of Australian Children’s Literature was one of these. It really is a treasure. Each chapter features full colour illustrations representing the best of our books for children, so the nostalgia factor is high. You really have to get hold of a copy for yourself to see just how gorgeous the illustrations are, especially the ones from the early days of colour printing. A for Australia/Which I am told/Is famous for Corn/For Wool and for Gold. The Bottersnikes feature in the chapter on Morality and the Family. I am aghast to find that this series is now out of print because these tales of the sweet and lovable Gumbles outsmarting the nasty Bottersnikes every time was a great favourite for 8-9 year olds in its day. In this chapter there is also a profile of Louisa Anne Meredith (1812-1895) who was the first woman to write about life in Tassie in My Home in Tasmania (1852). Like Ethel Pedley (who wrote Dot and the Kangaroo, which most children today encounter in video) she was a keen conservationist, and would be pleased to see how this theme continues to feature strongly in Australian children’s literature, by author/illustrators such as Jeannie Baker and Narelle Oliver. Pamela Allen, of course, is queen of children’s literature on the theme of home and family, and her sweet little books win awards year after year. My favourite is Mr Archimedes’ Bath because it teaches science concepts as well as being gently funny, but the kids love the Grandpa and Thomas series best of all. Ruth Park gets a mention for The Muddle-Headed Wombat, and Margaret Wild too in an interesting section on ‘the fox fable’, as well as one of her ‘edgier’ titles, Woolvs in the Sittee. I also liked the inclusion of several indigenous authors who are beginning to tell the stories of The Stolen Generations in ways that are suitable for children to understand. It bothers me that everybody knows the story of Anne Frank who hid from the Nazis in a cupboard in Holland, but not too many people know that fair-skinned Aboriginal children in Coober Pedy spent much of their childhood in a hole in the ground, so as to escape capture by authorities who wanted to remove them from their families under the misguided policies of the day. I was also interested to learn that there were three different illustrated versions of Oodgeroo Noonuccal’s Stradbroke Dreamtime, (which is now also out of print). Our school copy is the third edition illustrated by the celebrated artist Bronwyn Bancroft from the Djanbun People, and we have many of her books too, of which my favourite is Why I Love Australia: the children have written some beautiful poetry of their own after sharing this book. Not all of the authors and illustrators were familiar to me, so it was interesting to discover Ida Rentoul Outhwaite, Pixie O’Harris, the John Mystery series, Blue Peter, and Little Grey Colo the Koala. As a teacher-librarian what I found most useful was the way the author has used titles old and new to illustrate trends over the years, but the book also reinforced for me just how distinctive our Australian children’s literature is. It’s important for our children to see and hear stories about our animals, our places, our way of doing things, and even our slang – so we must make sure that we nurture our children’s authors and illustrators in the best, most practical way, that is, buying their books as birthday and Christmas and No Reason At All presents for the children we love.